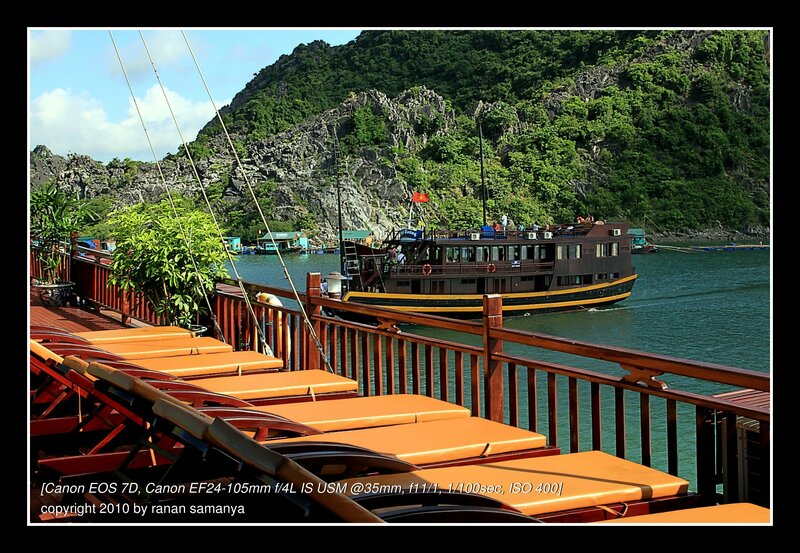 This is the cruise that brought us on a three days two nights adventure in Ha Long bay, Vietnam, September 2010. Our group consisted of quite a wide range of characters: apart from my family we have an Australian family (Ang is working with Telstra Australia, his wife ML -Marie Louise- is an environment officer with the government with their son Josh), Sam and Annie also from Australia (Sam is in the trade market), Heather and Hope are two teachers from the States (Heather is also a snowboard instructor), Victor and Violet from Hong Kong (if I recall it well Victor is in IT), and a local Vietnamese couple (later on we were told secretly by our friendly guide Đức Tiến Vu that he is the big boss of the travel agent). On the second night we were accompanied by a new member, Elissa. She is also from the States but is currently working in a refugee camp in Thailand. 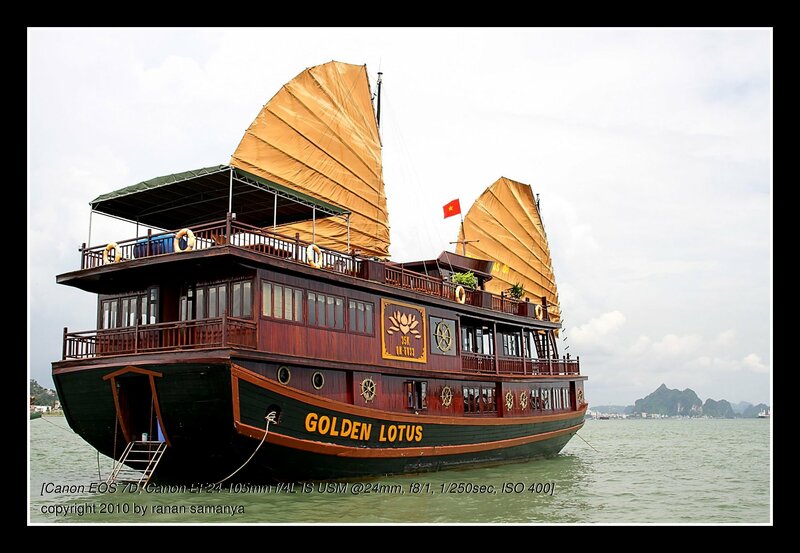 The Golden Lotus has 3 levels with 20 rooms of which 1 is a family room. The family room is actually a small suite with 2 rooms inside; the smaller room with 1 single-bed is on top of the vessel’s generator, and is not a recommended deal. This family room was also the source of a fight between I and the agency. It appeared that the Agency booked the only family room for both my family and Ang’s. Tien was very cooperative and patient when trying to solve this problem, and I respected him as a guide in this: here is a tour guide that puts clients on top of everything. We finally opted for two twin beds room and received refund for the mistake, made friends with Ang and his family (it was not, after all, their fault) and all enjoyed the cruise. The rooms were clean and luxurious for a junk. Everybody agreed that the sum that we spent (and it was not cheap) was worth every cent. 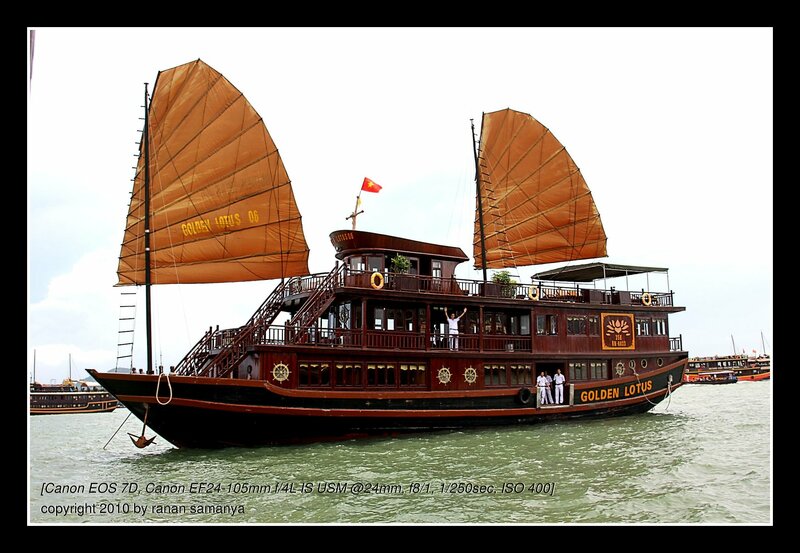 Sam mentioned that before he chose this particular cruise he has researched the entire internet and found that this was the newest junk in the region that time. Elissa, after spending one night with another junk, also confirmed that this was definitely much better than her previous one. The crews were nice, the meals were good (although strange enough they served us freshwater fish), the itinerary was great. But what made this cruise very memorable is the fact that each of our group blended in one with another, and we enjoyed everybody’s company. One rule that made all of us a bit annoyed was the fact that we were not allowed to buy drinks from outside the cruise and brought it in. All drinks needed to be purchased from the cruise. Heather once bought and drank some alcohol from a local on a small canoe from her window, the crew noticed her and got angry. By the end of the cruise she was presented a penalty bill! Anyway, most of use bough bottled water and smuggled them in. To be fair though, the rate of the drinks were not that sky-high, so this didn’t affect our overall satisfaction with the cruise.